FIIs were were net buyers of equity on the two trading days this week. Their total net buying was worth Rs 18.8 Billion. DIIs were net buyers of equity on Tue. (Mar 5), but net sellers today. Their total net selling was worth Rs 3 Billion, as per provisional figures. Nikkei India’s Services Purchase Manger’s Index (PMI) rose to 52.5 in Feb ’19 from 52.2 in Jan ’19. (A figure above 50 indicates growth.) The Composite PMI (Manufacturing + Services) rose to 53.8 in Feb ’19 from 53.6 in Jan ’19. According to data compiled by Centre for Monitoring Indian Economy (CMIE), the unemployment rate in India rose to 7.2% in Feb ’19 from 5.9% in Feb ’18. It was the highest unemployment rate since Sep ’16. The daily bar chart pattern of Nifty shows that bulls came back re-energised after the long weekend. Bullish sentiments had already received a boost last Friday (Mar 1) when the shot-down Indian pilot was returned unharmed by our not-so-friendly neighbour. War hysteria, fomented by several news channels, has died down. A huge cloud of uncertainty hanging above the market has been dispelled. The index rose more than 120 points on the back of combined FII and DII buying on Tue. Mar 5. Nifty gained another 65 points today. FIIs stepped up their buying, but DIIs were sellers. The index is trading well above its three EMAs in bull territory. 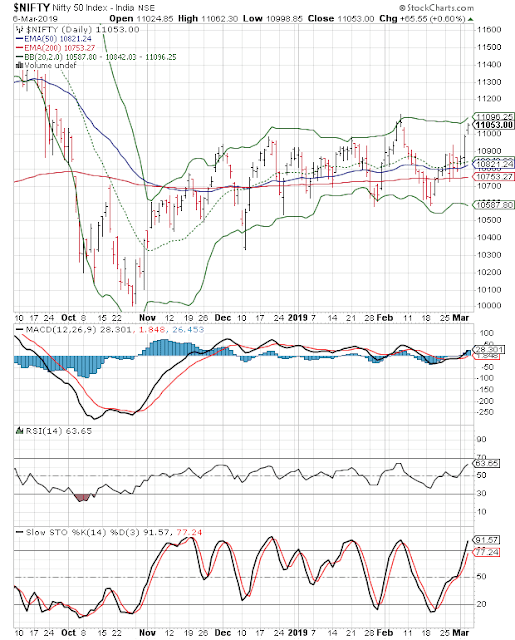 However, the upper Bollinger Band can hinder further index progress. Daily technical indicators are looking bullish, and showing upward momentum. MACD is rising above its signal line in bullish zone. RSI is rising above its 50% level. Slow stochastic has entered its overbought zone, and can trigger a correction. Nifty’s TTM P/E has moved up to 27.09, which is much higher than its long-term average in overbought zone. The breadth indicator NSE TRIN (not shown) has stopped falling inside its overbought zone, and can limit near-term index upside. Politicians have started a blame game and finger pointing after war rhetoric subsided. Market focus should shift now to underlying fundamentals – which are not looking rosy. Unemployment is rising. Economic growth is slowing. Rising inventories at auto dealerships are causing concerns. Expecting the index to keep rallying in such circumstances may be unrealistic. If you are among the lucky few who bought near last month’s low, book partial profits and lock in your gains. If you missed the rally, don’t jump in now. 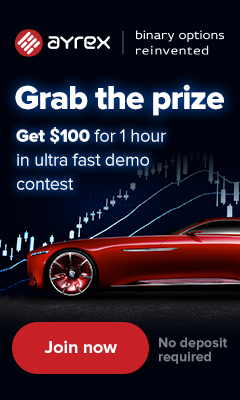 Use the rally to ditch non-performers in your portfolio.